Perfect for pool or dining areas or multi-family applications. Entry Arbors are a perfect accent to outdoor living areas. 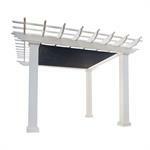 Manufactured from pultruded fiberglass, they are structural and will not rot, twist, or check like wood. The Entry Arbors are complete kits with hardware (including the Arbor-Loc® tie-down system.) They are prefinished with our white ChromaGuard™ engineered coating. HB&G’s Entry Arbors are affordable, easy to install, and offer low maintenance enjoyment and beauty to your outdoor landscape.